Illy isn’t calling it “Italian Coffee in a Can”, that is just what I thought of when I saw it. In my email inbox this morning was the below offer. 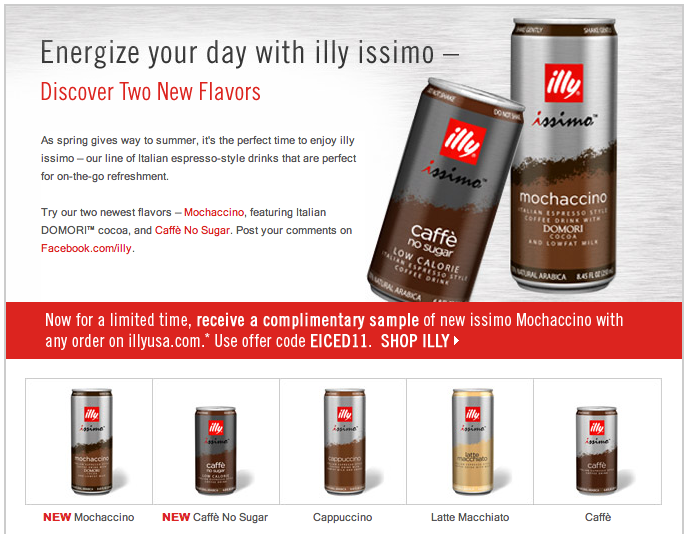 It appears that Illy is adding to their line of Issimo line with 2 new drinks… Mochaccion and Caffe No Sugar. As you can see in the screenshot of the email below, use the code to get a free sample when you make your next purchase through Illy. I will be doing research and report back here any caffeine and flavor information I can find. Let me know if you take them up on the offer how you enjoyed your Issimo. Previous post: Espresso with the speed of a puck machine but still real frothed milk!